Google Panda 25 Refresh/Update Here? All signs are pointing to a Google update being pushed out yesterday afternoon into today. The speculation across the SEO forums is that this is the Panda refresh we were expecting to see this weekend. Google's Matt Cutts said we should expect to see a refresh of Panda sometime this Friday or Monday. It seems like the Panda update started actually yesterday afternoon and is continuing to propagate throughout now. Is there an update happening? we're down maybe 40% or so since few hours ago. Im seeing some movement for my main keyword, go Panda go. I've also received several emails and comments about a possible Google Panda update. Google has not yet confirmed this update, nor do I expect them to confirm it since Matt Cutts also said that the future Panda updates will be more rolling updates. 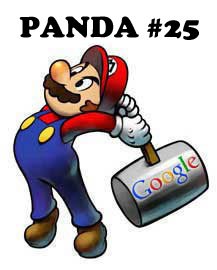 This may be the last manual Panda refresh we report - Panda #25 - welcome. Google Won't Confirm or Deny: I received word back from Google that since future updates will be rolling updates, Google is unlikely, going forward to confirm or deny Panda refreshes. I have a more detailed story on that over here. Previous story: Did Google Penalize BBC News For Unnatural Links?